Mouth Rehabilitation is a process when your mutilated dentition is completely redesigned and rearchitured. Mutilated dentition could involve, but not limited to, a collapsed bite, extreme wearing of your tooth, abnormal jaw relationship, discolored dentition, congenital tooth abnormalities. There may be situations where treatment is required in almost all the teeth.The intention is to make your mouth healthy and get rid of any existing abnormalities and mutilations. Anyone who is suffering from the above mentioned problems is an ideal candidate for a full mouth rehabilitation treatment. You should not ignore the early signs, they might become something severe, if not treated at the right time. 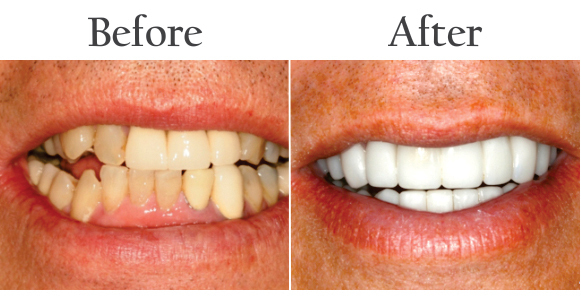 But if you are experiencing serious problems, a full mouth rehabilitation treatment can be the best solution for you. Problems like an improper bite can cause other severe symptoms such as headaches, dizziness, neck pain, etc. Don't avoid the early signs. We start the treatment by holding consultation session with the patient. Next comes the evaluation stage to fully understand the extent of the damage. Based on our findings, we offer the best solutions for mitigating and finally eliminating the pain or abnormalities faced by patient.